It was pleasing to see members supporting the Christmas function at the Victory Hotel. Some new members attended and others represented a wide range of eras. The Committee was pleased to see some members purchase copies of the History of QUR for Christmas but we would still like to sell more. Should you wish to purchase one, just call any of the members of the Executive listed on the back of the newsletter. We are still striving to encourage more ex QUR members to join the Association so we would ask for your support. Please pass on to any of us the name of any QUR member so we can assist them to join. This newsletter is the first one to be sent by EMAIL to those who have supplied their EMAIL address. For members who do not have an EMAIL, the newsletter will continue to be posted. We are attempting to maximize the EMAIL delivery to save us the expense of postage. If you received this newsletter by mail, but also have an EMAIL address, we would ask you to allow us to use that EMAIL address. Please send it to: peteramorton@bigpond.com. The Association has continued its commitment to providing academic prizes to the graduating classes. The presentation of the prizes for the class in 2003 will take place soon. I look forward to seeing you at the Back To The Regiment evening. QURA has been asked to notify ex officers of the above function. Please ensure your QURA address details are correct as the regiment will be inviting these members using the Association’s membership register. Contact Peter Morton – Ph 3425 3060, email peteramorton@bigpond.com if you wish to check your details. The Association congratulates Major Pat O'Keefe who was awarded the Medal of the Order of Australia (OAM) in the Civil Division of the Queen's Birthday Honours List in 2003. The award was in recognition of Pat's long and honorary service to various charities and the Army Reserve. 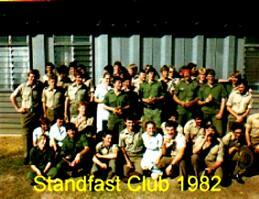 There are those of us who remember the 1st Training Group, at Sanananda Barracks, Wacol. I am often asked what is the Regional Training Centre, (South Queensland) and what is its relationship to the familiar concept of a Training Group. At the risk of boring people with history, it is helpful to remember what 1st Training Group (1 Trg Gp) looked like and what it did. A Formation commanded by a Reserve Brigadier. Of course there was a headquarters element, including a substantial quartermaster facility and a well-equipped and staffed RAP. e. specialist courses such as clerical, driving, catering, storemen (RTW). On 1 December, 1999 the Regional Training Centre (South Queensland) was raised at Wacol, and 1 Trg Gp passed into history. On 1 December, 2000 RTC (SQ) moved to Enoggera, where it remains today. Sanananda Barracks is quietly rotting, awaiting a decision on its eventual sale. The position of Reserve Brigadier passed for a time to the command of all RTCs and the training establishment at Canungra, with his HQ at Kokoda Barracks, Canungra. This Reserve Brigadier position has now been lost from SE Queensland. The Lieutenant Colonel command positions of OCTU, RURQ, and RTW were lost, along with the many Lieutenant Colonel command positions of the 7th Brigade when it was amalgamated with the 6th Brigade. The Reserve Brigadier position from 7th Brigade has also been lost from SE Queensland. A Unit commanded by a Reserve Colonel. The RTC in South Queensland is one of eight RTCs (NT, NQ, NSW, Vic, Tas, SA, and WA are the others) in a Formation commanded by a Regular Brigadier whose HQ is at Kokoda Barracks. There are three Wings, two of them with a Reserve Lieutenant Colonel as Chief Instructor, the other commanded by a Reserve Major. The HQ includes a Regular Lieutenant Colonel as Deputy Commandant, three Regular Majors as SO2s, a Regular Captain as Adjutant, and a Regular RSM. RTC (SQ) has an impressive instructional facility, including simulation of small arms firing, night training, and tactical operations. Officer training is provided in conjunction with Command, Staff, and Operations Wing at Canungra. ♦ Drinks A fruit punch & soft drinks will be available for those wishing to avoid alcohol. 1. Executive Committee HQ will be located adjacent to the bar. 2. Name tags will be available showing the vintage of your QUR service. My cheque (payable to QUR Association) for $ ___________ is enclosed.